My husband, Michael, has been doing CrossFit for many years, he started in NC. I tried a few classes with him there, but never really felt like a part of their community. Then, when he found Arsenal, and had been going for awhile, he kept telling me how awesome the coaches were and how happy he was that he found this place (he’d also tried another box in PGH before Arsenal, and it wasn’t a good fit). I really did need to do something—I was at my heaviest without being pregnant, and I just wasn’t feeling good about myself. I tried working out at the JCC, but it was always on my own and honestly no fun. So, I signed up for the Summer Shred Program. Brooks was so encouraging and the other people in the program were really motivated as well. It was a great experience. So, I decided to “try” crossfit again. My first impression was “these people ‘elite’ lifters”. It has always been intimidating to me. I don’t consider myself to be “strong” physically and I really do not like running, and everyone seems like gazelles compared to me. That the days I get to Arsenal are better than the days I skip. I’m not a natural “self starter”, so I can find excuses NOT to go pretty easily. The best days are the days I don’t listen to the excuses. 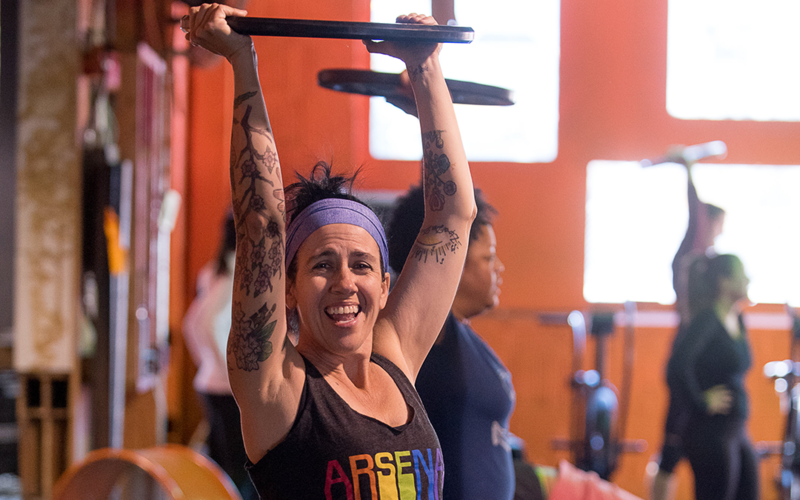 I’m going to be sore the next day no matter what (even if I skip that day’s WOD), so I might as well go and keep “working on my form” until I can get some of the bigger weights on my bar! I’m trying to be better at going more often. I’m starting to know more people, and that really helps too.